Ipilimumab is a monoclonal antibody that blocks cytotoxic T-lymphocyte antigen4 (CTLA-4), an inhibitory molecule typically expressed on T cells. Blockade of CTLA-4 induces an overall activation of T cells, including an immune-mediated anti-tumour response. Unfortunately, this broad T cell stimulation also causes immune-related adverse events (irAEs), such as dermatitis, colitis, hepatitis and hypophysitis. Ipilimumab is currently available in Belgium as a second line of treatment for patients with advanced melanoma, and is used at a dose of 3 mg/kg of body weight, although higher doses were previously used (up to 10 mg/kg). We performed a retrospective analysis to identify melanoma patients treated with ipilimumab at the Ghent University Hospital between 2010 and 2013. 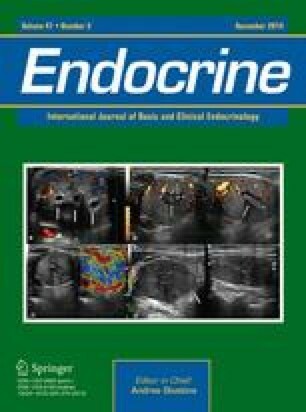 Data on symptoms, stage and timing of ipilimumab, response and adverse events were collected with a special attention to endocrine disturbances, going from a limited involvement of one endocrine axis to development of a hypophysitis. We identified a total of 39 patients with stage III (No. = 7) or stage IV (No. = 32) melanoma, who received a dose of 3 (No. = 31) or 10 (No. = 8) mg/kg. Six patients developed a severe form of irAEs, including one case of colitis (2 %), one case of sarcoidosis (2 %) and 4 cases (10 %) of hypophysitis. Hypophysitis developed between the second and fourth cycle of ipilimumab administration and was independent of the dose used. We describe four cases of involvement of the pituitary gland during treatment with ipilimumab. When managed with vigilant monitoring and high-dose corticosteroids, the acute symptoms resolve, but lifelong hormone substitution therapy can be necessary. Involvement of the pituitary axes is a severe side effect of treatment with ipilimumab with an urgent need for the correct medical intervention. The authors have nothing to disclose and indicate no potential conflicts of interest.